EXTREME power bills and crippling toll charges will be dealt within the first term of a Luke Foley Labor government. 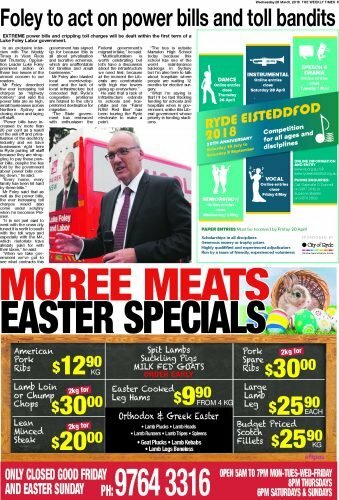 In an exclusive interview with The Weekly Times, Opposition Leader Luke Foley promised action on these two issues of the utmost concern to our readers. Mr Foley described the ever-increasing toll charges as “highway robbery” and said the power bills are so high, small businesses across Northern Sydney are closing down and laying off staff. “Power bills have increased by more than 20 per cent as a result of the sell off and privatisation of the electricity industry and we have businesses right here in Ryde putting off staff because they are struggling to pay these power bills, despite the lies told by the government about power bills coming down,” he said. Mr Foley said that as well as the power bills, the ever increasing toll charges would also come under scrutiny when he becomes Premier. “It is not just east to west with the cross city tunnel it is north to south with the toll ways and especially with the M4, which motorists have already paid for with their taxes,” he said. Mr Foley also blasted local overdevelopment and the lack of local infrastructure but conceded that Ryde’s congestion problems are related to the city being a preferred destination for migration. “The State government has embraced with enthusiasm the federal government’s migrant intake,” he said. He said that a lack of infrastructure extends to schools and hospitals and his ‘Fairer NSW Red Bus’ has been touring the Ryde electorate to make a point.